H. Rick Bamman - hbamman@shawmedia.com Fruin Farms worker Pete Palczynski (cq) of Huntley disks a 10 acre field owned by Paul Ziller Thursday, October 25. The tracktor is equiped with a GPS autosteer system allowing operator to be more effeciant while working the land. H. Rick Bamman - hbamman@shawmedia.com Pete Palczynski (cq) of Huntley and a worker for Fruin Farms returns to the tractor cab after making an equiment adjustment while plowing a field field along Hemmer Rd. owned by Paul Ziller Thursday, October 25. 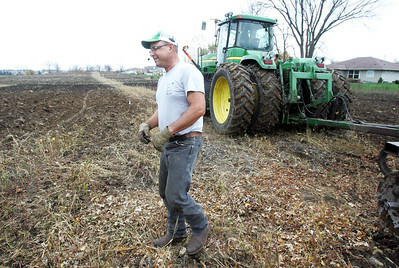 Palczynski was preparing the 10 acres of land for the next growing season. 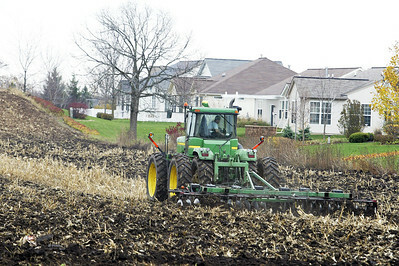 Fruin Farms worker Pete Palczynski (cq) of Huntley disks a 10 acre field owned by Paul Ziller Thursday, October 25. The tracktor is equiped with a GPS autosteer system allowing operator to be more effeciant while working the land.